Details magazine is helping to celebrate the Meatpacking District with a day of shopping, style, music, entertainment and special guests. The day will feature discounts up to 20% off at some of the area’s busiest shops, including Theory, Tracy Reese, Banana Republic, Puma, An Earnest Cut & Sew, Calypso, Rebecca & Drew and more. Participating restaurants will feature free Bollinger champagne tastings, food tastings and discounts. The Hotel Gansevoort will host seven pop-up stores including Le Blanc, Remington, Asics, Dunhill, Hanes, Epson, and Kenneth Cole. Click on http://www.meatpacking-district.com/flash.html for a guide to participating shops, restaurants and more details. 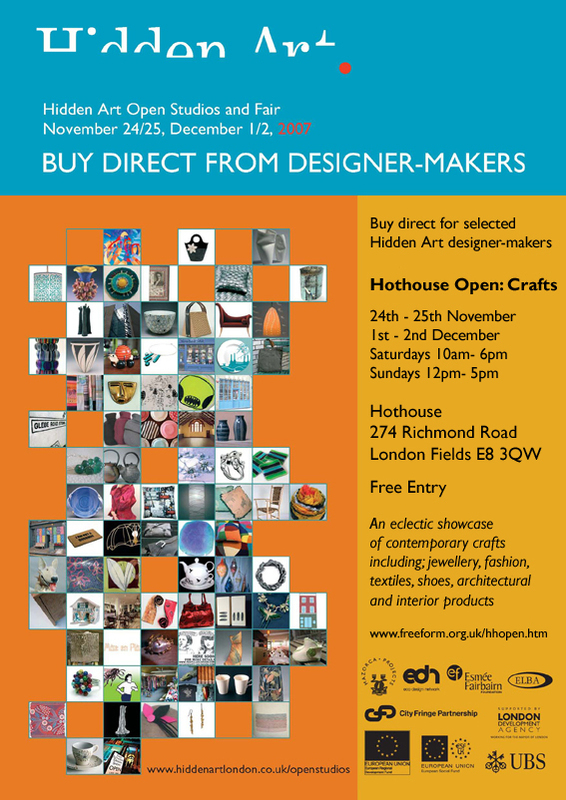 This year the event will be brought back to its East London roots, while offering opportunities for all Hidden Art designer-maker members (both in London and the UK) to be involved. There will be more activities, and places of interest involved in the event, including a Hidden Art Fair as well as the regular studios opening their doors to the public, bringing a community feel to this exciting event and an increase in visitor numbers. The House of Grand Marnier and Hotel Gansevoort welcomes the pleasure of your company and invites you to participate in The Grand Marnier Tasting Experience. I often wonder what makes a networking event successful. Is the number of attendees, the business exchanges or the money the organizer will make or lose? If the number is important, tonight's NetParty networking event was definitely a success. There was a long line at Hiro Ballroom venue and inside many more. We all had our name tag on the top of our shirt or jacket. To make ourselves known and be present. I didn't find anything professional during the night (although I admit I left very early!). The venue, a nightclub, can't be the ideal location for a professional networking meeting. It was dark, relatively loud and the number of attendees as high as it was prohibited from social interaction. To me, the large number of attendees (800 based on their website) was a disadvantage. How you can introduce yourself to someone when it is dark, you are squeezed by someone who is pushing you and you can't see the name of the potentially interesting person who came to network with you? And don't get me started with the promised and highly expected from hungry professionals hors d'ouevres. Very few that left as soon as they were out! I managed to get a melted cheese canapé in a questionable quality bread....that was all! Finally, who on earth decided that professional networking events are actually dating parties? To my knowledge and from my experience from serial networking for nearly two years in London, professional networking has nothing to do with flirting and dating. For those, you go to events for singles or speed-dating parties. Single men were approaching me in a very flirtatious mood but they didn't do it well. If you want to flirt, do it all the way. Don't pretend to be interested in my business or career. Because you aren't my man! Tonight's event was actually interesting to observe. The NetParty networking objectives may been satisfied. But for me, it wasn't what I personally expect from professional gatherings. The event tonight belongs to a different sphere - that of the social/dating/having-fun on Tuesday night/ sphere. I won't return to confirm. I am certain. Maybe a change in NetParty's objectives wouldn't be a bad idea. Or title. Just keep the "social", delete the "professional". Nov 19th: An Evening With Samsung - Is Every Mobile Phone a Smartphone? Join the Mobile Monday crowds, tonight for a thought-provoking discussion. When: Monday, Nov 19th, 6:30-9 PM as always with a lovely networking reception compliments of the gracious host Samsung. Fri 11/16 - Sun 11/18 (5PM) at The Metropolitan Pavillion & Altman Building. It's back. It's stylish. It's better than ever. We're talking the Billion Dollar Babes sale. You'd better be there, baby! Visit their website http://www.billiondollarbabes.com/ for information about membership, events and sample sales! In an effort to promote German Riesling as the perfect wine pairing with the Thanksgiving meal, Wines of Germany will be hosting a series of in-store Riesling tastings at various wine stores in New York and San Francisco. Visit the website http://www.germanwineusa.com/press/events.php for a detailed list of wine tastings from November 12 to November 17th! Visiting a chocolate show is an interesting experience that includes all senses: taste, touch, feel, smell and view. Only the hearing can’t be satisfied from such a visit and feels lonely and unsatisfied. The chocolate show in Manhattan last week was both fulfilling and overwhelming. I entered the building from the press entrance, to my delight and I avoided the crowds. Or I thought so. On a Saturday afternoon, there might be hundred different things someone can do in NYC. But chocolate is always an attractive choice. In all forms: as food, cooking class, activity and even show. 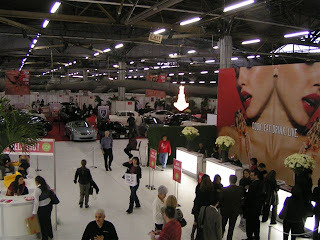 Despite the masses, I visited all stands and representatives of chocolatiers from all over the world. I also tried (or I should speak the words and say ATE) lots of chocolate! Too much choice, too much fun! I also had the chance to attend a live seminar on how to prepare the “white chocolate pumpkin chiboust”. The chef, from the very well-known Buddakan restaurant was entertaining and reassuring: "If you cook veggies, don’t be afraid to add some fat". So butter is on the table! And cream. The outcome was a pleasant and tasty experience despite the fact that it wasn’t dark (rather yellow from the pumpkin). It looked and smelled good. My appetite was satisfied. And a number of my senses. I admit it. I like chocolate. Although not a sweet tooth – I always give up dessert in a three-course dinner and I go for the coffee instead. But I like it plain (not in the form of muffin, cake, pie, brownie or tart). Milk it can be, with almonds, hazelnuts or raisins. And dark. And raw. White. With berries. Pralines. With pistachios. In small square pieces. Spicy chocolate (with chilies or piquillos). Tiny bars for the “petites” sized-people. I also like chocolate mousse, truffles, chocolate ice-cream and chocolate coffee. Yes, this show gave me the opportunity to experience with all of the above. Like a child in a candy store, I allowed myself to relax, eat and smell, play, touch and see. Now, I know. Chocolate is not only my favorite “sweet”, it’s the only one. On my way out, I was overwhelmed but also inspired. I felt like Proust describing sensations while eating his favorite “madelaines”. For a 21st century blogger, chocolate has the same effect: brings feelings and memories but also imagination. And a delightful taste in my mouth. Campari projects presents Eva and Franco Mattes at Artists Space - Nov 13‏, at 6.30pm. RSVP by calling: 6462051607. Visiting a food and drink festival can be a tempting, enjoyable and also challenging experience. The task is even harder when you have to pick and choose (to see, taste and drink) from over 100 different exhibitors, restaurants, presentations and workshops. But I managed and I had a very good time. I visited pretty much everyone and I tasted everything: from cheese, to wheat-free crackers, New York apples, oils and vinegars to Asian restaurant samples, mini cinnamon cheese cakes (my favorite), cote d’or chocolates, honey-roasted nuts, canapés and Ghirardelli choco dark pleasures, I satisfied my appetite and I proved that Food Festivals should be renamed as “Christmas for adults”. I also tried and indeed, drank amazing wine from all over the world: Spain, Italy and California to mention a few. I didn’t forget the cocktail samples, refreshing and strong enough to give you a buzz! Despite the long way to the end of the exhibitors, I found the time to go to a couple of presentations and didn’t miss the chance to attend two very resourceful and entertaining workshops: how to prepare a cheese plate and how to pickle fish and veggies, facilitated from Steve Jenkins (a world-known cheese monger) and Johan Svensson (executive chef at Aquavit) respectively. Now I am done, with my stomach full and my taste delightfully satisfied, I am ready to move on. 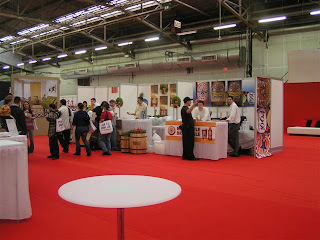 What the most important thing was, except for the great number of tastings, that I learned more about myself and food. Definitely a wine and chocolate fan, I also noticed that I prefer cold to warm food. So, maybe, pickled fish might become one of my daily eating habits. And lots of cheese! Escape without packing your bags! Sky360 by Delta arrived on October 3rd, and you are all invited to come on-board! Open to the public during the day, you can spend an afternoon sipping complimentary Coca-Cola beverages from the Midnight Sky Bar while you snack on the culinary creations of Chef Todd English. Explore new in-flight experience, including all-leather seats, movies and music, the AvisConnect Wi-Fi service, and the American Express Connectivity Lounge with mobile charging stations. Sky360 by Delta is located at 101 West 57th St. NY, NY 10019, on the corner of 57th Street and Sixth Avenue, between 10 a.m. and 4 p.m., Tues–Sat through November 10. 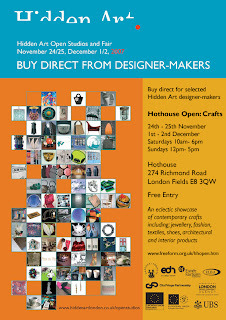 Still a few days to visit! It's a cool place to hang out for a couple of hours!